Working with large batches of tasks has its drawbacks. One mistake can mean having to redo an entire batch. Discover the alternative in this SFB episode. Achieve more and minimize mistakes in your business with this simple tip. 02:07 – What can you do in small batches? Smaller test sizes make for smaller mistakes. [Click To Tweet]. Check your work early to make sure it’s on track. [Click To Tweet]. Validate your ideas before developing them. [Click To Tweet]. James Schramko here and I have a question for you. Have you ever done up the buttons of your shirt and found when you get to the top, that you’ve missed one somewhere and it’s all out? Or perhaps you put laces in a shoe and you found that when you get to the end, one of the little loops has been missed? Now here’s a thought for your business. I want to talk about the concept of small batch sizes. What does that mean? It simply means doing the smallest batch you can and then checking your work. This is 101 process optimization. Edwards Demming did this in Japan to help them revolutionize the car industry. If you are a baker and you’re going to bake a cake, you could have all of the ingredients mixed and bake the cake. But if you slightly over cooked it or the ingredients are wrong, the whole cake gets chucked out. 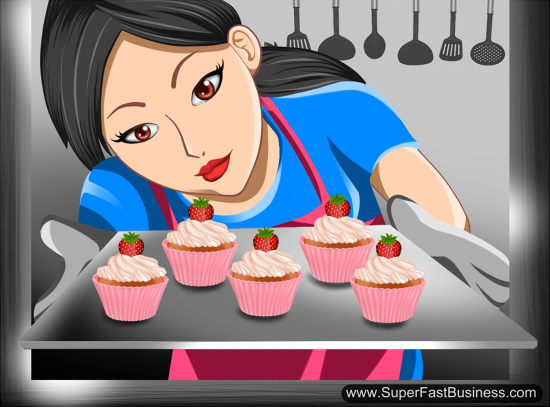 Instead, if you make a little test batch, put in little small cupcakes – maybe put five or six – put them in there, check them. Once they’re good then roll out the rest of the batch. So how does this apply in your business? Well just before this video, I made a fantastic video. It was amazing! It was a one-take. Everything was spot on. And when I went to check it, guess what? I forgot to plug the microphone in. I’m using a boom mic, right here. And it was all sitting there, everything was great, the screenshot was in focus, everything was perfect, except that little plug wasn’t plugged into the camera, and there was no sound at all. Now I could have had backup. I could have had a second recorder which is probably a smart thing to do. But instead I recorded this whole thing and then I went to check the video. And when I checked, there was no sound. So what did I do? I went back, I plugged in my cable and I thought, I’m going to make you a video about small batch sizes. Now here’s the thing, imagine if I had sat down and recorded 10 videos in one big batch. We’ve been taught to batch our tasks from our time management training. Now here’s the thing, I would have 10 videos with no audio. The cost of redoing that is significantly more than one video. So think about this: What can you do in small batches or test sizes or sample sizes, or how early can you check your work to make sure that it’s on track? If you’re a web developer, test the site early with the customer. Make sure that you get the feedback before you build it. And if you got a great idea, make sure you validate it. Get someone to pay you first before you roll it out. Before you go on develop it. I get phone calls from people saying they’ve invested a million dollars in software because they have a great idea and “nobody’s doing it” and they’d like me to help them market it. Well that’s all backwards. It’s wrong. Soon we’re getting a guest on the show who’s going to talk about that stuff. But in the meantime, think about how you can get a smaller batch size, a smaller cycle. You can read about this in a book called “The Lean Startup” by Eric Ries. There’s also a similar book by Ash that I’ll link to in this video notes. I’m interested if you can tell me about the worst big batch you’ve ever done. What was the thing you did a lot of and then found out it was useless? I’m sure there’ll be plenty of war stories. I know I’ve got a few. I’ll look for your comments before this video. Hope you’ve enjoyed this episode. Hope the sound came through. I’m James Schramko. Hmmmmmmmmmmm.. let me see…. email batch size?? oops! I recorded this before that however yes!!!! Great post James and definitely “evergreen”. I can’t think of a large batch size that I screwed up recently (I’m sure it’s in there somewhere if I dig hard enough) – but I did do a Google Hangout recently where I spent at least half the time presenting a screen that the audience couldn’t see. I was recording it as well, so it was a complete do-over costing more than an hour of my time. However, at least I got out there and did it. If I had waited for a time when I could have someone else available to monitor the presentation and let me know something was wrong…I’d still be waiting to do the Hangout! So I agree totally with the small batch sizes in order to reduce the odds of making “big” mistakes, but at the same time I say we need to embrace mistakes because otherwise we’ll never break out of our comfort zone. The key is to keep those mistakes as small as possible with small batch sizes. Thanks for the video, I thought at first that it was going to be about “check lists” so that we don’t miss a step (like plugging in a mic before recording). Maybe that could be your next video? i had a similar video here http://www.superfastbusiness.com/business/how-to-reduce-errors-in-your-business/ it is rare i will forget something since i use checklists for most things. perhaps i will add one for this. James, you rock the checklists! So if you missed a step then anyone can. Don’t feel bad – I recently read the checklist manifesto about how bringing simple checklists into emergency rooms in hospitals around the world made a significant improvement. I appreciate the checklist you added to OTR and need to create and print out checklists for everything I do – even the ‘no brainer’ stuff since we all make mistakes and put our t-shirt on backwards/inside out sometimes. Thanks James. I’m very guilty of having a “big idea” and then going full blast into it without ever testing to see if it’s actually needed or wanted. I’m definitely going to be looking to the small batch size model in every aspect of my business. Thanks. LOL – it happened so many times that I didn’t even press the record button while doing screencast. I’m up on the idea of doing a test batch, but once that test batch is refined, do you roll out a large batch? It seems that once you have a proven formula economies of scale would kick in. I ordered 150 Christmas photos… That didn’t fit in the envelope with the cards they were meant to accompany. Whoops! In the Lean Start Up there is an exercise around the envelope. If you had One christmas card and one envelope you will find out fast! Yeah, i read the book. I understand that the small batch size helps with a trial run, but then what? Once you know the sizes are right, is it more efficient to move into large batches once the small batch is proven? I didn’t see that covered in TLSU. Logically, it makes sense to do a test batch… but then what? Sometimes I am doing things that static – a la assembly line. Usually, not.